Lack of goals will always overshadow the tactical nous of managers, so it poses no question that the lacklustre finishing from the players on field surely disappointed the spectators that expected at least a few goals in the 90 minutes played. The first miss of the day occurred when Salomon Kalou danced his way passed defenders in the centre of the pitch and slid the ball through to Jonathan Kodjia, who could only toe-poke it into the arms of Agassa after a contentious last ditch tackle from Gakpe. His best chance (and worst miss) happened in the 57th minute when Serge Aurier delivered one of the best crosses of the tournament, but the striker failed to connect a solid header to it. Fortunately for him, he was offside. Aurier didn’t end the game without fault however, as he himself headed wide a Max Gradel delivery in the Ivorians’ last attack of the game. Togo, who were probably expected to defend more than attack, also had their fair share of missed opportunities. Emmanuel Adebayor finally lost his markers and was through on goal, but miscommunication with teammate Kodoho Laba culminated in the latter sending a shot wide of the post. Mathieu Dossevi, who tirelessly entertained the fans with his display, had a 1-on-1 attempt against Gbohouo saved around the half-hour mark. Both players fluffed their lines again in the second half, with Laba missing a header in front of goal on the 78th minute (similar to Kodjia’s miss) and Dossevi, while under pressure from the Ivorian centre backs, attempting an audacious chip that went over the bar. For every good Ivory Coast player on the field, there was a another that failed to play well. Despite short bursts of good play, the champions failed to capitalise on many chances and will be disappointed to walk away with a solitary point. Michel Dussuyer’s decision to give Wilfred Zaha his Cup of Nations debut looked like a good choice, mainly when he was skinning Atakora and Djene on a few occasions and winning free kicks outside of the area. He was the liveliest of Ivory Coast’s attackers, which raises the question as to why he was replaced by Wilfred Bony instead of the ineffective Kodjia. One of the bright spots was the centre back partnership of Wilfried Kanon and Eric Bailly who both did well to keep Togolese captain Adebayor quiet for a lot of the game. Due to the high number of corners in the game, as well as the long ball approach and aerial bombardment by Togo, the pair ensured that a clean sheet was achieved at the end of the game. Set pieces from the team require extensive improvement before the next few games. Numerous free kicks floated over the bar and the abundance of corner kicks were headed away by the opposition defenders. For a player that hasn’t played a competitive game since May 2016, Emmanuel Adebayor could be forgiven for a rusty performance in front of goal, but his work rate and passion were evident in this game, including a row with Serey Die just before the second half! Facing Eric Bailly was always going to be a difficult task, so Adebayor changed his playing style to accommodate the rest of the team and make their attacks more efficient. Dropping deep and drifting off onto the wings allowed Dossevi, Laba and Ayite to get into the action up front. Coupling simple passing and effective dribbling also helped create space for his teammates. He was substituted in the 88th minute and received a massive round of applause from the supporters who were elated by his performance. It’s a shame that he wasn’t able to register a goal in the game (his most notable effort was a long range shot that sailed over the bar in the first half), but the encouraging display will be enough to help him through the remaining two group games. Herve Renard came into this game not fully set on his best XI or his best system, with injuries to key players adding on his list of issues to ponder. For this game he opted for the 5-4-1 system that was not too dissimilar to the one that proved to be useful when he steered Ivory Coast to victory in 2015. Medhi Benatia, Manuel Da Costa and Romain Saiss were the three men at the back and they were rarely troubled by Cedric Bakambu or any of the DR Congo attack. The poise of Mbark Boussoufa and Karim El Ahmadi operating just in front of the defence saw Morocco have control of proceedings for much of the game. 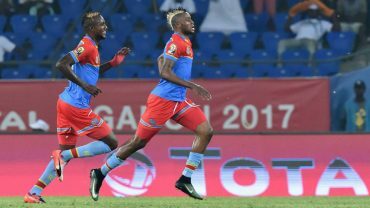 The pressing of the Morocco players, particularly those in advanced positions, saw DR Congo outplayed in the first half – they were barely able to string more than a few passes together before they gave the ball away. The 19-year-old Ivorian-Moroccan Hamza Mendyl, playing at left wing-back, had particular joy down his side in the first half and with better composure in the final third he could have been decisive. Renard had a world class right back in Serge Aurier on one of his wings during his time at Ivory Coast, and he could have done with similar quality here, as good as Mendyl’s first half was given he has no extensive experience of top level football. When the game got to half time Morocco were so in control that it wouldn’t have come as a surprise if Ibenge made a substitution. Ibenge didn’t do that and his team were still second best until Munir’s error gifted Junior Kabananga a goal. History will remember this game as a defeat to Morocco but it will be one of those occasions where the score doesn’t tell the whole story, at least tactically. If DR Congo deserve any credit from this game – and they deserve very little, on the balance of play – it’s that they managed the Morocco onslaught well despite being down to 10 men and, with all three substitutes used, captain Gabriel Zakuani hobbling at centre half for the final chunk of the game. The Atlas Lions’ search for the equaliser saw space open up and the fresher legs of Dieumerci Mbokani and Jacques Maghoma did an efficient job of running down the clock to alleviate pressure from their team-mates. Ibenge has, bizarrely, received praise for masterminding this victory, but it was more a win that was gifted through an error rather than the tactical outwitting of an opponent. He had no credible answers to Renard’s system, and it’s a worrying sign for when they meet a superior team. Ivory Coast are next. The injuries of Younes Belhanda, Sofiane Boufal and Nordin Amrabat, plus the exclusion of Hakim Ziyech, are well documented and have left Renard short of three good players. It’s impossible to say whether any of them would have made a difference on the night, but the likelihood is they would have had a say at least. While the trio of injuries were unavoidable, Ziyech’s inclusion may be something Renard will rue on a night like this. Morocco, bar Munir’s error, did everything right but score. And they’re up against it now – two big performances are needed against Togo and Ivory Coast, with little margin for error.